Can Aloe vera help with ailments as diverse as arthritis, acne, burns, eczema, periodontal diseases, digestive conditions, and more? Why is it commonly utilized in the cosmetic, complementary medicine, and food and beverage industries? What do you need to know when buying products containing aloe vera? Aloe Vera: Nature's Ally To Health And Healing answers these questions and much more. We explain the history of Aloe Vera, guide you through the process of cultivation all the way through to the end products, and explain the extraordinary symphony of more than 75 bioactive ingredients that brings the power of this amazing plant into clarity. Accompanied by impressive and informative photos, this book is detailed enough to give you the knowledge you need in order to make the best decisions when growing the plant yourself, or simply buying Aloe Vera products. It also includes many practical tips and a few recipes to try at home. Piet Viljoen, scientist, formulator and managing director Aloway Natural Health Products understands that nature provides people with what is needed for health and healing. But it is up to us to take those gifts and utilize them in the best way possible. 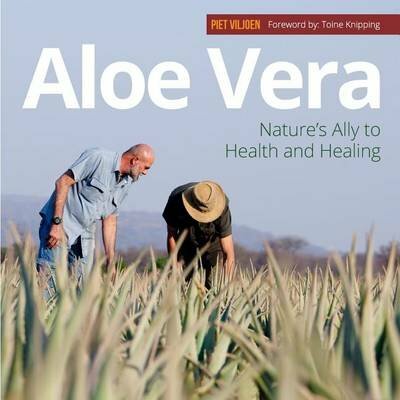 This book allows you to understand and appreciate why Aloe vera is one such gift! ALOWAY NATURAL HEALTH PRODUCTS is an experienced cultivator, processor & exporter of Organic & Natural Aloe Vera raw materials in various grades & concentrations. Our service includes flexible, technically designed offerings of tailor-made product solutions, specific to our client’s individual industry requirements. Our Premium and Standard quality Aloe Vera ingredients are offered in both Cosmetic and Food grades. A wide variety of applications exist; from hand creams & First Aid gels, to health juices, dietary capsules and food supplements. Aloway’s 40 hectare plantation & on-site factory are located in the fertile rural lands of the Limpopo province in South Africa. Geographically this allows for optimal climatic conditions for the GAP Organic cultivation of our Aloe plants, utilizing only organic fertilizers - guaranteed pesticide, herbicide & germicide free. Manual harvesting methods and precision Dutch engineered manufacturing procedures ensure premium quality products, containing the highest possible bio active Aloverose (polysaccharides) levels. All our products undergo independent NMR Spectroscopy analysis by recognized German laboratories, confirming the highest quality standards worldwide. Aloway Organic products are certified HACCP, NOP, Eco-cert, Kosher & Halal. Aloway is committed to supporting the social enlistment & economical development of local communities. By promoting job creation, education and training Aloway is endeavoring to promote & establish a new, self-sustaining, economically independent agricultural industry in South Africa. Creating awareness and inspiring hope for healthy futures is key to our dynamic company’s philosophy. With reliable sales & distributor offices situated across Europe, Africa and Asia, our clients can choose from a wide variety of products, while being assured of quick turnaround times, professional service and personalized assistance.